Family Owned & Operated Offering Nature's Finest Maple Products! "LIKE" us on Facebook! We post regular information and events on this page. 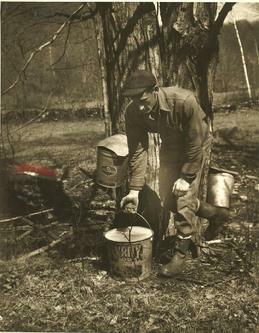 In the 1940's, as a young man, John Chambers, Jr. gathered sap in Chambers Valley. 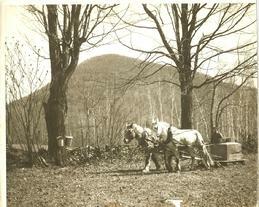 He worked with horse drawn sleighs and metal pails. In 1990, Kevin Keyes began sugaring using metal pails and a homemade evaporator that provided just enough syrup for himself and his family. In 1995, Kevin convinced his brother in-law, Bob Chambers (John's son) to begin sugaring, since then they have been working together in what started out as a hobby into a growing business that provides maple products to individuals, local retailers and country clubs. The equipment has changed, from horses to tractors, and from metal pails to tubing, enhanced with a vacuum system. Today, our mission is to provide the finest quality maple products while enjoying our hobby with family and friends. We welcome visitors year round. At the Sugar House you are always welcomed with warm smiles from family and friends that have stopped in to see how the "sap is running". You will enjoy the aroma of sweet maple syrup as it is bottled. Sugaring Season runs approximately mid February - March. 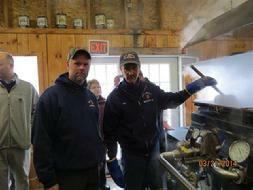 Join us for our pancake breakfasts during New York Maple Sugar Weekends. 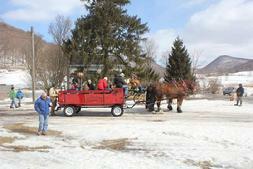 Weather permiting we have horse drawn sleigh / wagon rides. Please call to confirm we are boiling. The magnificent maples of New York and vermont produce outstanding flavored syrup. The darker the syrup the stronger the flavor. Maple Syrup, Cream and Candy are available for purchase year round. We at Dry Brook Sugar House Respect Your Privacy and Will Not Share Your Personal Information With Any Third Party.